Military police first fired their assault rifles over the heads of protesters when they arrived at the Veng Sreng Street protest on Friday, before quickly shifting their lethal aim to be level with the stone-throwing strikers, according to interviews with almost 20 injured witnesses at three hospitals Tuesday. Patients recovering from military police gunfire at Preah Kossamak, Calmette and the Khmer-Soviet Friendship hospitals also told of military police shooting wildly at large groups of people and later picking out individual protesters as targets after being unable to disperse the protest despite the deaths and injuries inflicted on Friday morning by the well-armed officers. The military police killed five people and seriously injured at least 42 others when they opened fire to disperse the mostly stone-throwing protesters who had set up barricades along the garment-factory-lined Veng Sreng Street in Pur Senchey district. The strikers also had crude and largely ineffective Molotov cocktails. Hem Oeun, 23, said he was throwing stones at the military police when they raised their rifles and fired above the crowd of protesters, most of whom were already trying to flee. “When they arrived and descended from their trucks, they were already shooting around,” said Mr. Oeun, who worked at a garment factory inside the Canadia Industrial Park. Down the hall at the Khmer-Soviet Friendship Hospital, Ouk Mara, 17, sat on a mat on the hospital’s balcony with her head wrapped in gauze and white bandages. Mara said she was crouching down and walking alongside her bicycle while trying to get home from high school when a bullet “scraped” the top of her head and knocked her to the ground. Mara said the lethal intention of the military police was clear. “They weren’t afraid of the protesters throwing stones, they were only angry at them,” she said. “I saw them shooting only to kill. It was like watching children play with fireworks,” the teenager said of the military police picking off protesters with their rifle fire. Also at the hospital Tuesday, Choeun Sreypov, 26, said she had not been injured but she had taken it upon herself to coordinate the ferrying of people injured around Veng Sreng Street on Friday to the hospital. Lao Sreytouch, 22, said her brother, 21-year-old Lao Sao, had barely been able to communicate with her since his ear was blown off by one of the AK-47 rounds fired by the military police. “He was participating in the clash and the bullet entered near his left eye and went through his ear. He had been turning around to flee the military police,” she said, as her heavily-bandaged brother lay in a bed on the hospital’s balcony. “We don’t know if he will be able to hear again,” she said. Chhoeng Yav Yen, deputy director of the Khmer-Soviet Friendship Hospital, said that his hospital had admitted 31 garment workers who had been shot or beaten by police on Friday. He said that a further four had either died at the hospital or arrived there dead. Dr. Ku No, a doctor in the hospital’s intensive care unit, said that two of the four workers died during emergency surgery to remove AK-47 bullets from their chests to stop hemorrhaging. Heath Rady, 20, another worker from the Canadia Industrial Park, was shot in the chest, just above her left breast, and also in her left upper arm, but doctors have told her that she will survive. “The doctor said if I had been shot any lower [in the chest] I would be dead now…[but] now I also can’t move my left arm at all, or even feel it when people touch it,” she explained. Som Im, 22, had bullet wounds both behind his left shoulder and on his left chest, marking the path of a bullet that had passed through his body. Mr. Im said he had been retreating from Veng Sreng Street into a residential complex and was throwing stones at military police when he was shot, but said he did not know who shot him. His friend, Chea Noth, 25, said he saw the shooter. “I saw them shooting rifles from the top of the building. They were picking us off one by one, but I was lucky because I was low down [near the base of the building],” Mr. Noth said, pointing to a lightly bandaged bullet wound on his left calf. Dr. No said that treatment for patients shot during the protests was being paid for by the hospital. All but one of the injured workers interviewed confirmed they were not being charged. At Calmette Hospital, staff who asked not to be identified said that seven injured workers from Veng Sreng had been admitted to the hospital, and that six had since been released. The last remaining patient, Chao Hundy, 23, had been beaten so badly by military police on Friday that he was still only able to talk for very brief periods of time, his doctor said. The doctor, who asked not to be named, said Mr. Hundy, whose face was on Tuesday entirely purple as he lay asleep in his hospital bed, had required life-saving surgery upon his arrival to stop multiple hemorrhaging points and to remove his spleen. 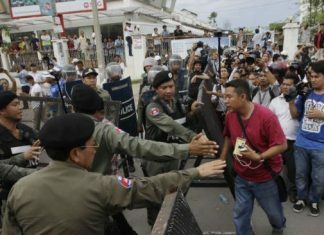 The seriously injured man’s sister, Chao Sreychan, 28, said he had gone to his factory to see if it had reopened for work and had remained behind to watch the chaotic scene after the clashes broke out. A morgue worker at Calmette confirmed that one worker, Sam Ravy, 26, had arrived at the hospital dead on the back of his friend’s motorcycle. Records at Preah Kossamak Hospital also showed four people from Veng Sreng had been admitted with bullet wounds to their stomach, thighs and arms on Friday, but that two had been released. One of the workers, 19-year-old Hoeun Khan, echoed the story of Friday’s events provided by other injured workers. Mr. Khan was shot in the right thigh but said doctors had said his muscle would recover in time without any problems. So Nar, 27, said doctors had not told him whether he would recover fully from wounds he had sustained while standing on the third floor of a residential building on Veng Sreng. “I was shot through the stomach and intestines and the bullet passed through me. I had run upstairs to my room to watch it all and they shot from the ground upward and got me,” he said, noting that his stomach was still being regularly drained of blood.